Hello, everyone! Happy Monday. 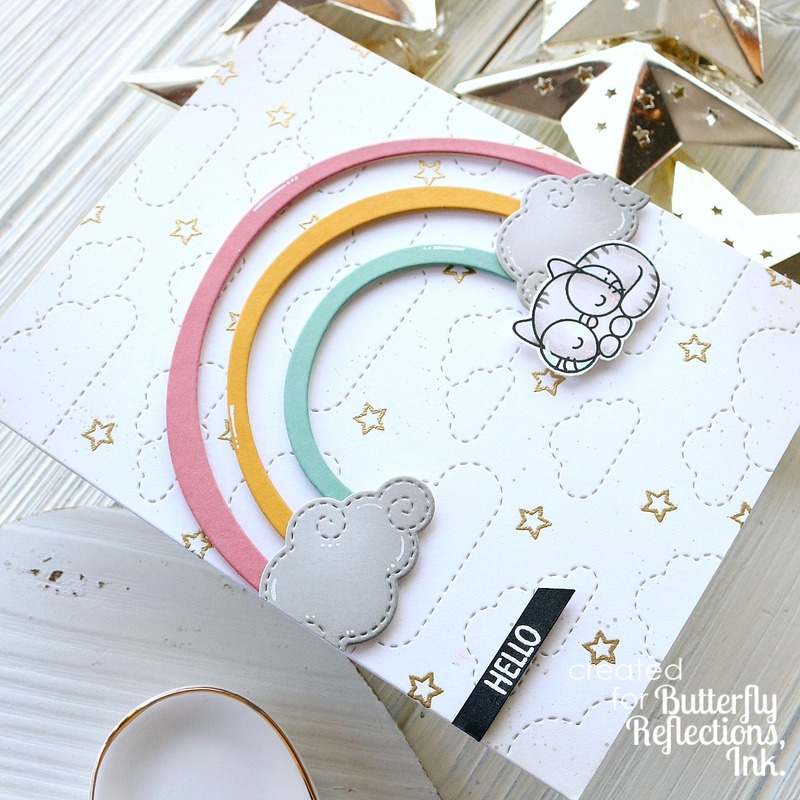 I’m back today to share a cute and simple birthday card I made by mixing some new and old Penguin Palace products. Let’s jump right in. I started by doing some ink blending with a stencil I made using the new It’s Your Day Bubble Call-Out die. Using the negative of the die cut I ink blended some Distress Oxide onto an A2 size card panel. I positioned it so that it hung over the top edge of the panel, and splatterd some water droplets over it for a textured look. Next I die cut one of the borders from the Fancy Hearts Scalloped Boarders die set to use as a frame on the card. I colored the frame with one of my Copic markers. That piece was adhered to the card panel with a liquid adhesive. Finally, I stamped and colored one of the adorable unicorns from Birthday Unicorn stamp set. Once it was colored I die cut it out with the coordinating dies and adhered it with some foam tape below the speech bubble. After adding some white gel pen details to the card it was complete! I hope you enjoyed this card I made for today. Be sure to check out all the newly released products from Penguin Palace! Thank you for stopping by today, and I’ll see you again soon with another card! So Mush Room In My Heart! How sweet is this little mouse on the mushroom? And that sentiment?? So cute. I used a Polaroid die from YNS to frame him, and did some easy ink blending for the picture’s background. Thanks so much for stopping by today! I hope you’re all having such a great weekend, and I’ll see you again soon with another card! Hello, everyone and happy Friday! 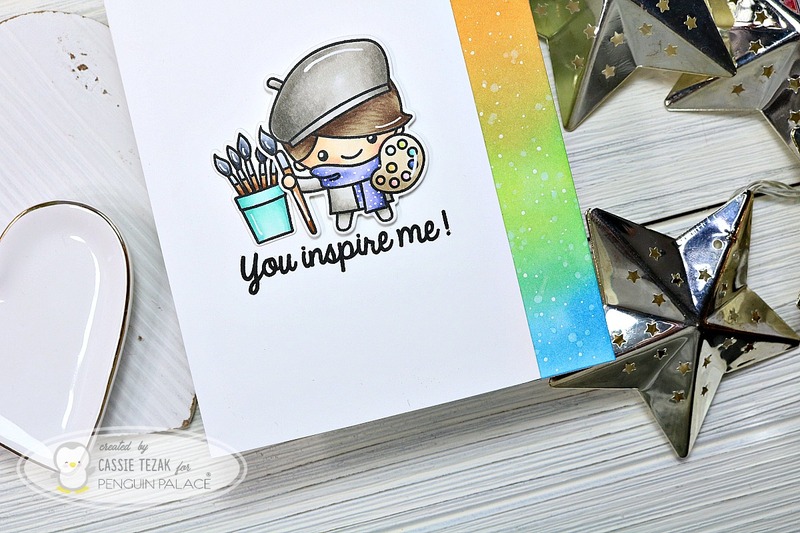 I’m popping in today to share a card I made for the new Your Next Stamp challenge. The new challenge is all about pastels. Here’s my card! I just had to use the new panel die from the March release along with the So Mush Fun stamp set! I think they’re so darn cute. I ink blended some of my favorite Distress Oxides over top of the panel die (Worn Lipstick, Shaded Lilac and Dried Marigold) and splattered it up. Then I added my die cut pieces over top with foam tape! How much fun is that?? And so springy! Be sure to head over to the Your Next Stamp blog and see the rest of the inspiration form the team. Thanks for stopping by, and I’ll see you again soon with another card! Hi, everyone! I’m back to share my project for today. I decided it was time to use the Mark My Words bookmark dies. I have a lot of family and friends who I know are going to love getting some adorable bookmarks with these dies! 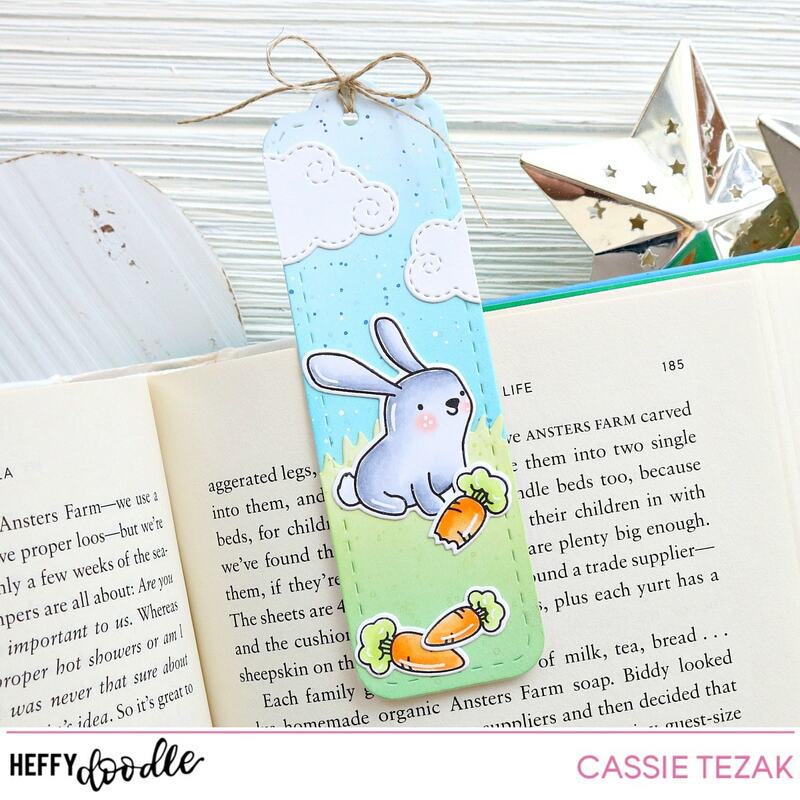 For today’s bookmark I decided to go with a spring/Easter theme. I started by die cutting three of the same bookmark shapes. There are two designs in the set, but I wanted to use some twine on mine, so I went with the one that had the hole at the top. On one of the bookmarks I ink blended Broken China and Tumbled Glass Distress Oxide over it. Then I splattered it with Blueprint Sketch and Milled Lavender Distress Oxide that I’d watered down a little. Over the second book mark I ink blended over the entire die cut piece with some Distress Oxide that I’d mixed myself with reinkers. Finally, for the last bookmark, I used the Grassy Lass Border dies to cut the bottom off. Then I ink blended Twisted Citron and the hand mixed green-ish color I used for the back side. All three pieces were set aside to dry completely while I worked on the other pieces. I stamped out the bunny and carrots from the Honey Bunny Boo stamp set and colored them in with my Copic markers. Then I die cut them out with the coordinating dies and added some white gel pen details. 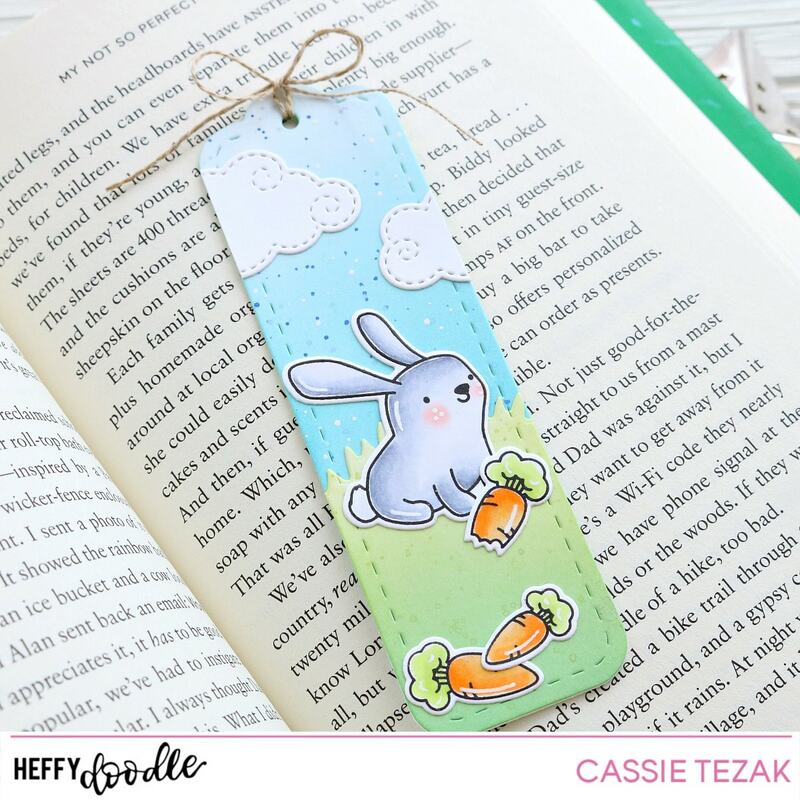 I adhered the grass bookmark bottom to the blue bookmark, as well as the bunny and carrots. I decided I didn’t like how empty the top was, so I went ahead and die cut some of the Swirly Clouds and adhered them down, trimming off the part that hung over the edge. 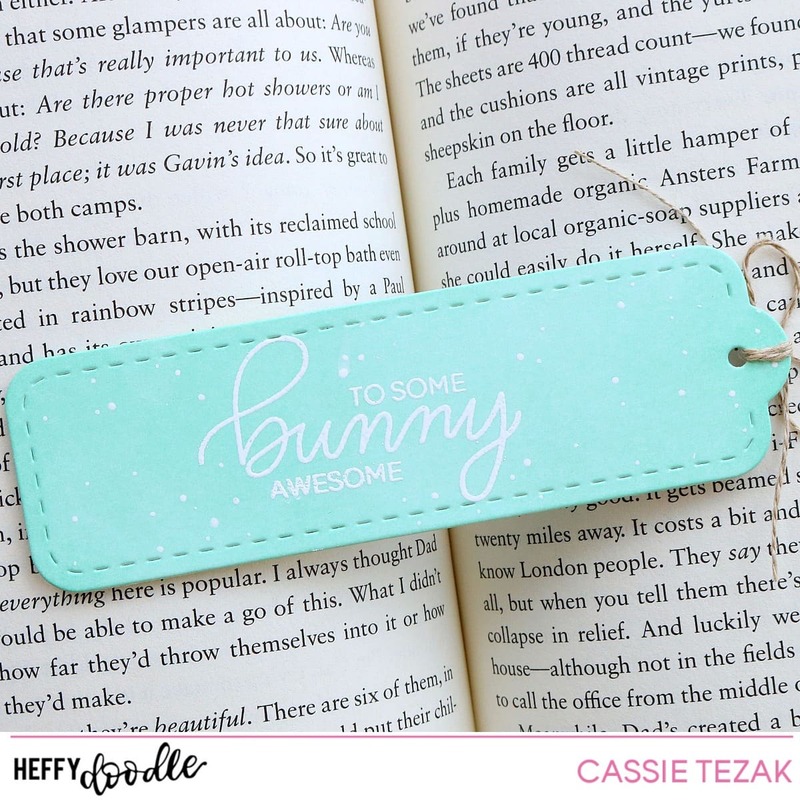 For the back of the bookmark I heat embossed a sentiment from Honey Bunny Boo, mixing two of the fonts. I like the way the ‘bunny’ is so big and pretty! I added adhesive only to the top 1/2 inch of the bookmark, so that the two pieces could be sandwiched together and be used like a clamp. To finish off the bookmark I added white dots to the back side, and a dainty twine bow at the hole at the top. And that’s it for my project today! I hope you enjoyed it! I have a feeling this is going to be sent out in an Easter care package to one of my friends 🙂 Thanks so much for stopping by today! I’ll see you again soon with another card! Pink & Main 5th Birthday Blog Hop! Hi, everyone! Welcome to my stop on the Pink & Main 5th birthday blog hop!! Who doesn’t love a birthday celebration?? There are so many fun projects and some amazing prizes to be won. But first, let’s get to my card! 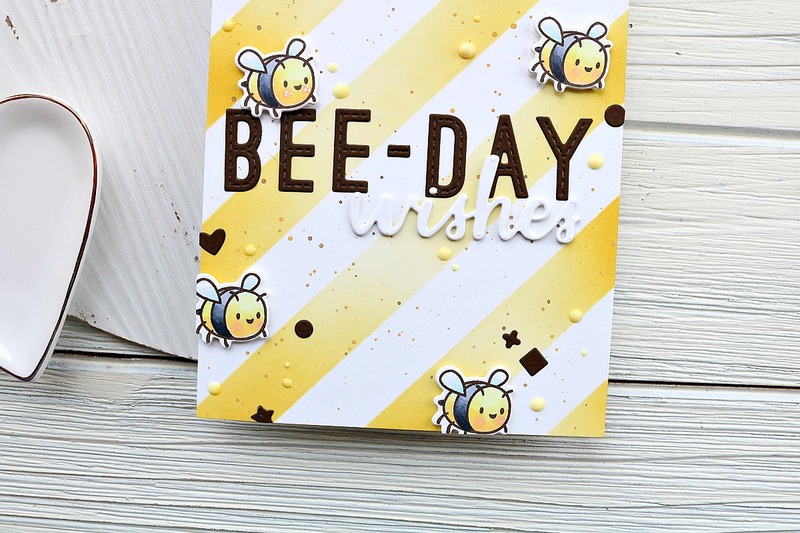 I started this card by die cutting the Celebrate die from a piece of A2 size white card stock. I did both the outline and the word celebrate, setting the word aside to use later. Then I got to stamping! I stamped out the four different balloon designs in Pumice Stone, Fossilized Amber, Worn Lipstick and a greenish blue Distress Oxide Ink. The greenish blue ink was one that I created using Distress Oxide reinkers and a custom Distress ink pad. If you haven’t tried that yet, you definitely should! I let the ink dry completely, helping it along with my heat tool, and then I stamped the cute designs over each balloon in VersaMark ink. I heat embossed them all with white embossing powder. I think the designs for these balloons are SO cute! They add so much character to them, and are such a cute detail. Once that was done, I stamped the balloon tails and some confetti in the open spaces of the card panel. It’s hard to see in the photos, but is a nice subtle finishing touch for the balloons. To finish my card I put a piece of yellow card stock behind the opening that I die cut and then adhered the ‘celebrate’ die cut to that. 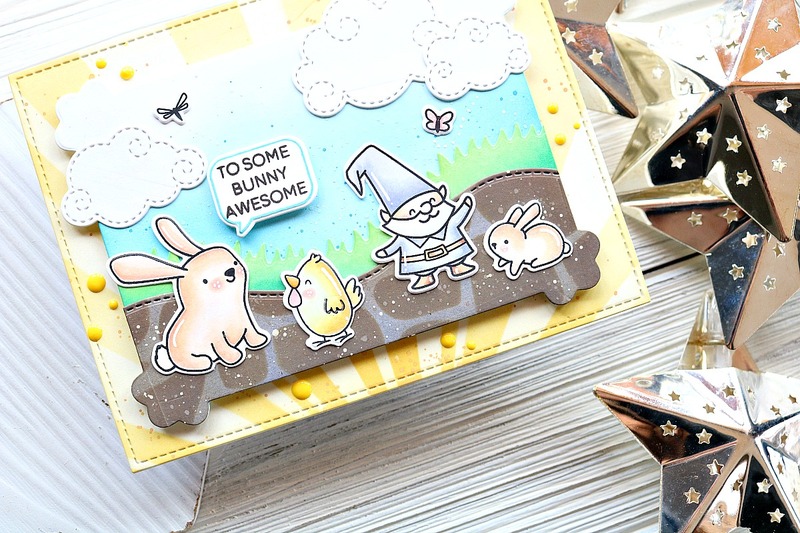 I attached the whole panel to a card base and stamped the “let’s” from the Celebrate stamp set to finish the card! Alright, ready to try your hand at winning some prizes? There are going to be five random winners picked from comments left on each bloggers post. You could win $50 to the Pink & Main store just by leaving some comments! Your next stop is: Donna! So be sure to keep hopping and leave some awesome comments! Hi, all! It’s time for another My Favorite Things sketch challenge! This week I went with more masking to create the look. Let’s jump right in. Here’s a look at the sketch! And here’s the card I created inspired by it! I created some triangle masks using some post its and a craft knife. Then I started stamping my scenes. I stamped some pups and other images from the new Best In Show stamp set. I also filled in some spaces with images from the Lucky Dog stamp set. I used the negative mask of the triangle and stamped in some black, Copic friendly ink. Then I removed that mask and applied the positive mask. That’s when I would stamp in a gray ink. Using my Copic markers, I filled in the triangle area as well as colored the images. This took some time, but turned out really cool in the end! Once all my coloring was done I added some white dots to the triangle backgrounds and details to the images. I also splattered some watered down Pumice Stone Distress Oxide ink for some extra texture. I heat embossed the sentiment onto one of the Stitched Sentiment Strips dies, trimming off the end, and popping it up with some foam tape. I attached the card panel to a card base and that finished my card for today! I hope you enjoyed my take on the sketch. Be sure to see the rest of the inspiration on the MFT blog! Thanks so much for stopping by, and I’ll see you again soon with another card! Good morning! I’m popping in to share a card I made for the new Create a Smile challenge. This week’s theme is ‘monochrome.’ I always end up going with grays or black and white for these challenges for some reason, and this card is no different! This such a cute and simple card! You could definitely mass produce this design with different sentiments for all occasions. I stamped the elephants from Poppin’ Over along the bottom of the card and colored them in with my Copic markers. Then at the top I stamped the Friends from Friends Like You at the top. I added some white gel pen details and that was it! Be sure to head over to the Create a Smile blog and join us! Thanks so much for stopping by today. I’ll see you again soon with another card! Hi, all! I’m just popping in today to let you know I’m on the Create A Smile blog today sharing this card. I’d love it if you went and checked it out! I’ve got all the details on how I made it as well as what I used while creating. Thanks so much for stopping by today. I’ll see you again soon with another card! Hi, everyone! 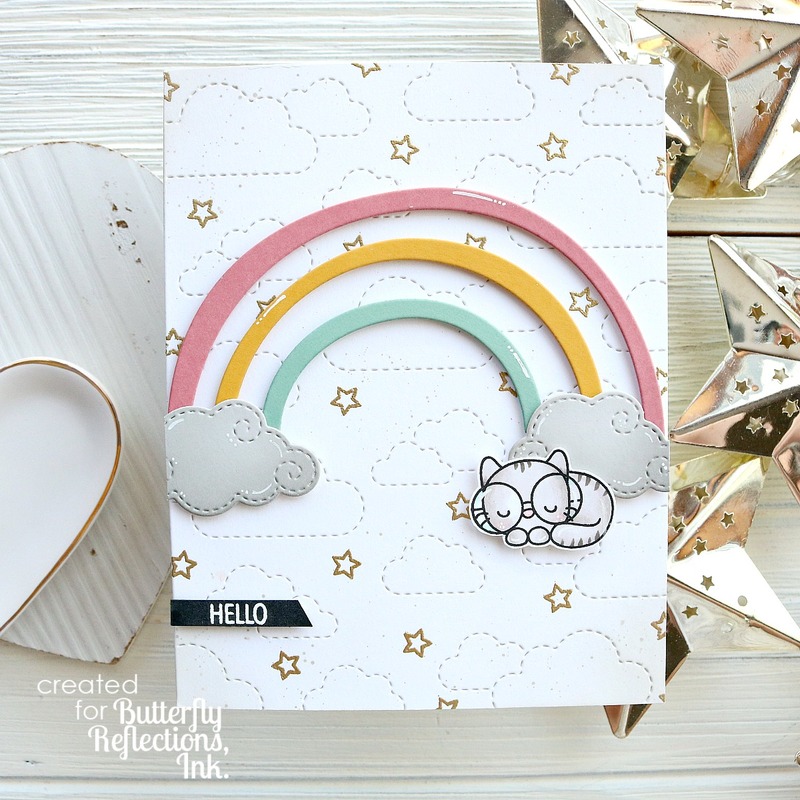 It’s Cassie here from Creatively Cass and I’m back to share a cute card I made for the blog today! I absolutely missed the St. Patrick’s day window this year, but I still wanted to get a rainbow card in, and this is what I came up with. I’ve had the Rainbow Wishes die set from Concord & 9th forever, and it was time to finally use it! 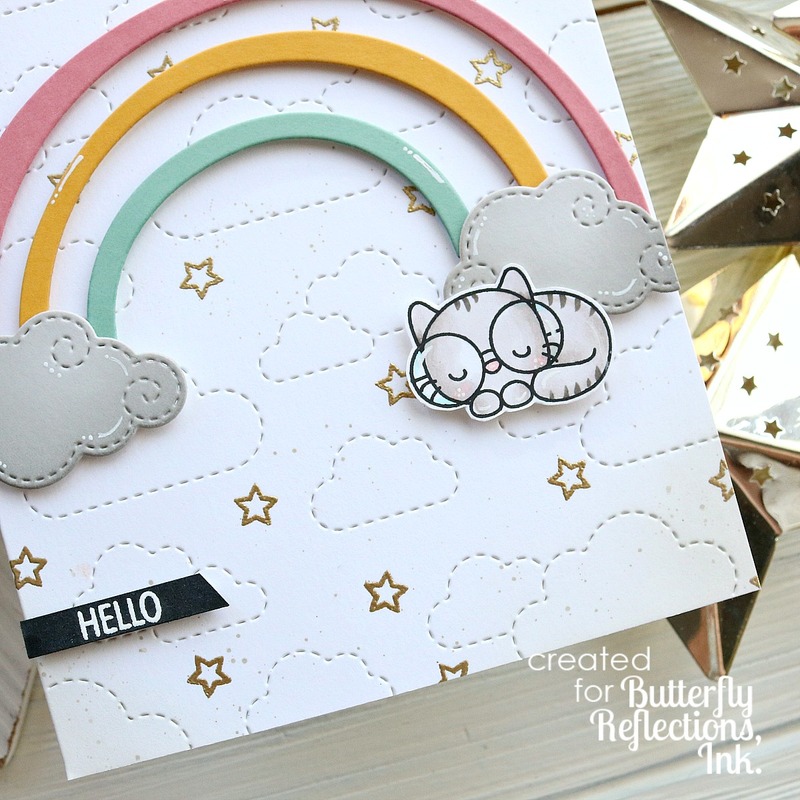 I die cut some of the rainbow pieces out of the new Lawn Fawn card stock colors Pencil Eraser, No. 2 Pencil and Sage Leaf. I love these new colors and can’t wait to use them again! I also die cut some Heffy Doodle Swirly Clouds dies from a light gray cardstock. Then I used Black Soot Distress Oxide ink to darken up the bottoms of them a little. I die cut the Stitched Cloud Backdrop die from white card stock and heat embossed some little stars all over the panel with gold embossing powder. I thought this added a cute touch to the background, without adding any competing colors. I also ink blended some Pumice Stone Distress Oxide in the corners and splattered a little bit of the color watered down for some more texture. I stamped out the cute little cat from the Mama Elephant set Book Worm and colored him in with my Copic markers. I kept the coloring really simple, and I love the way it turned out so soft. I popped everything up with foam tape and adhered it to the card base. Hi everyone! It’s Cassie here, and I’m back today to share a cute card set I made using the adorable Dinky Dinos stamps. My sister helped me with the design of these ones (ok actually she basically told me what to do!) and I love the way they turned out! Both cards were put together pretty much the same way, it’s just the colors that changed. To start I took two card bases that were roughly 4 1/2 by 4 1/2 and ink blended over them with the Stoney Maloney stencil. Then I used a die cut from kraft card stock over the stenciled card base to create a highlighted circle in the center. Once that was in place I did some heat embossing. I stamped the ‘baby’ from Eggcellent News onto the stenciled background, and the ‘welcome’ onto some black card stock with I trimmed down into a banner. Next I stamped out the dinos from the Dinky Dino stamp set and colored them in with my Copic markers. As per my sisters instruction, I went with lovely pastel colors for them. They were each adhered down on to the card. Finally, I die cut some of the Swirly Cloud dies and placed them on the cards. And that’s it for my two creations today! I think these turned out so adorable! I just love those Dinky Dinos and the Stoney Maloney stencil-especially how cute they look together! Thanks so much for stopping by today. I hope you enjoyed the cards. I’ll see you again soon with another card soon!